Chester: Shenton, Grand, Howson, Waters, Jackson, Roberts, Burton, Crawford (Green 62), Mahon (McKenna 62), Murray (Dudley 62), Waring. Subs not used: McAllister, Thomson. Brackley Town: Lewis, Murombedzi, Walker, Byrne, Hall, Dean, Lowe, Armson, Ndlovu, Baker (Fairlamb 71), Walker (Sterling-James 85). Subs not used: Nti, Myles, Jackson. Chester’s home campaign concluded with a blank scoresheet against play-off bound Brackley Town. The visitors impressed in the first half especially as they dominated the Blues who were fortunate to reach the interval with their goal intact. Howson and Grand partnered one another in central defence after Livesey was injured in the warm up and struggled at times to cope with the immense physical challenge of Ndlovu. The Brackley forward turned his man and got through to shoot fiercely at Shenton who did well to parry the effort to safety. The visitors won a number of corners and seemed to be trying out several training ground manoeuvres which City did well to repel. Panic stations ensued when referee Elliot Swallow awarded an indirect free kick on the edge of Chester’s six-yard box for dangerous play. It was all bodies on the goal line as Chester’s wall stood firm after Brackley’s first attempt was disallowed as a false start. The Saints had an even better chance to break the deadlock when Mahon clipped Shepherd Murombedzi’s heels in the penalty area and the referee pointed to the spot. To rub salt into Mahon’s wounds, aggrieved at conceding such a soft penalty, he was booked as well. Byrne stepped up confidently and then scooped the ball over the bar – much to the delighted approval of those in the Harry Mac. Should their play-offs have to be decided on sport kicks the thought of this one might come back to haunt Byrne. Somehow City escaped until half time but Brackley had been quicker of mind and body all over the pitch. Although City looked a little bit more resilient at the start of the second half they were still decidedly lacking in pace and continued to make negligible impact on an assured Brackley defence. On the hour mark, however, three subs were introduced all at once and City’s tempo began to lift. McKenna and Green began to run purposefully across the park, with the ball at their feet and the Blues attacking ideas livened up. Howson blazed a howitzer well wide from distance after one of McKenna’s mazy runs. Green left his marker behind with a Cruyff turn and crossed to the far post, just beyond the head of Waring. Dudley’s drag back just failed to come off on the edge of the area which would have capped a great move. Green lost his way on one foray into the box but with the full-time whistle approaching launched a venomous effort at the end of a good move with McKenna which Lewis partially saved. Howson failed to connect with the rebound before Waring was given offside. The Exiles, match sponsors today, chose Gary Roberts as their man of the match – he worked tirelessly in the midfield battle. 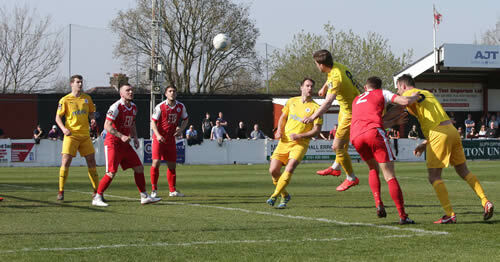 Shenton could not have been far behind, though, he had one of his best days in the Chester goal. City’s outside chance of making the play-offs evaporated with that Green effort but at least they had given a livelier account against very solid opposition for the last half an hour of the match. Their efforts were reflected in the warm applause the players received at the end of the match. The appreciation showed by those who stayed no doubt a reflection that, after the traumas of last season, some sense of stability had been restored this time – and the though they may have fallen short of the play-offs this season, some foundations have been laid for the future. Ashton United: McMahon, Lees, Regan, Chalmers (Swaby-Neavin 66), Ashworth, Goulding, Sheridan, Mantack (Reed 46), Hobson, DiMaio, Tomsett. Subs: Roberts, Ennis, Kay. Chester: Shenton, Jackson, Howson, Grand, Livesey, Waters, Roberts (Mahon 66), Burton (Green 72), Murray, Dudley (Crawford 66), Waring. Subs not used: Thomson, Green, McKenna. Goals from man of the match Iwan Murray, Dany Livesey and George Waring bring a comfortable victory at Ashton United. Chester: Shenton, Thomson, Grand, Livesey, Waters, Jackson, Roberts, Burton (Murray 62), Mahon (Crawford 80), Green (Dudley 62), Waring: Subs not used: Howson, McKenna. York City: Whitley, Griffiths, Ferguson, Newton, Moon, Moke, Langstaff, McLaughlin, Burrow (Wright 89), Burgess, Kempster (Parkin 80). Subs not used: York, Bencherif, Bartlett. 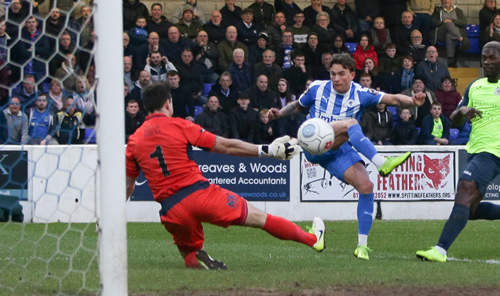 Despite fighting back twice to earn a point, results elsewhere mean that Chester’s play-off aspirations are now looking slim. Chester: Shenton, Waters, Jackson, Grand, Livesey, McAllister, Roberts, McKenna (Waring 53), Mahon, Asante (Mooney 71), Dudley (Howson 54). Subs not used: Burton, Green. Stockport County: Hinchcliffe, Minihan (Cowan 60), Duxbury, Turnbull, Palmer, Stott, Thomas, Walker, Bell (Osborne 79), Warburton (Keane 55), Stephenson. Subs not used: Ormson, Gilchrist. Chester were thrashed 6-0 by Stockport who headed to the top of the table as the Blues slipped to tenth following this humiliating defeat. 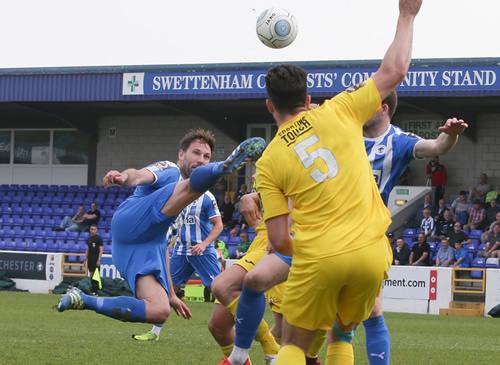 The Blues started badly and were a goal behing in the opening ten minutes as a Scott Duxbury cross evaded Matty Waters at the far post where Adam Thomas headed back for ex-Blue Nyall Bell to tap home from close range. Ten minutes later the Hatters doubled their lead through Sam Walker whose low shot took a deflection to take it past Grant Shenton in the home goal. As a contest the game was over on the half hour as the visitors grabbed their third goal. A mix-up between Simon Grand and Danny Livesey allowing Bell to run through on goal and score with easy past Shenton. Chester rarely threatened though Ben Hinchcliffe was called into action making a fine save to deny Livesey who headed a Craig Mahon cross goalwards. The Blues management made changes bringing on George Waring and Steve Howson but to little effect as Darren Stephenson side footed home Stockport’s fourth goal moments after Bell just failed to complete his hat-trick. Walker added the fifth goal from the penalty spot after Sean McAllister had fouled Stephenson, and the misery was completed at the death with substitute Jordan Keane scoring the sixth goal from long range. Nuneaton Borough: C.Belford, Obeng, Sharpe, Townsend, Addison, Lundstram, Lussey (Kelly-Evans 83), Caton (Dunkley 80), Calveley, Edmunds, Allen (Eccleston 70). Subs not used: T.Belford, Morrison. Chester: Shenton, Waters, Grand, Livesey, Jackson, Mooney (Mahon 67), McKenna, McAllister, Roberts, Asante (Green 80), Dudley (Waring 61). Subs not used: Howson, Marsh-Hughes. A last minute Danny Livesey goal brings a vital victory from bottom of the league Nuneaton Borough to keep the play-off hopes alive.